Indie software developers are used to monitor their website traffic. With the new Installation Analytics tools, they can now also monitor their software installations and removals. In this article, we show how you can create a Google Analytics custom report that will show you the timeline of installations and removals of your desktop software. Our application analytics library, SoftMeter, can be used in your Windows or MacOS software to send hits to your Google Analytics property. The tracking is based on "Event" hits that your installation package must send to Google Analytics. During the installation, an event hit with Event label equal to "Install" must be sent. 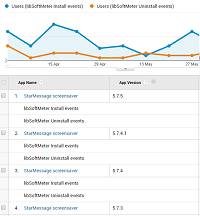 During the uninstall, the Event label must be "Uninstall"
SoftMeter binds the event label together with other useful information, like users' country, screen resolution, operating system, application version, and sends the data to your Google Analytics property. Create two new segments that will record the Installation and Uninstall event hits. The screenshots below show the needed filtering, based on the "Event label" value. Work on the "Explore" tab first. You can add more tabs later. The screenshot below shows the parameters of the custom report. Save, run the report and select the two new segments. Remove the segment "All users". The reporting result will be like the following. You will see the two segments as two separate lines. You can also see the break-down by application version. You can understand if your users adopt the latest version and upgrade to it. You can reveal if some users still install older versions of your software. You can modify the custom report to see different breakdowns, for example, see installs and uninstalls per operating system version, to discover incompatibilities. With SoftMeter, you can go even further than the Installation and removal monitoring of your software. You can call SoftMeter's functions from inside your desktop application and send real-time usage analytics to your Google Analytics property. A free monitoring tool for your software application. Ideal for shareware developers who can monitor free vs paying user installations, most used application features, track application exceptions and crashes and much more.